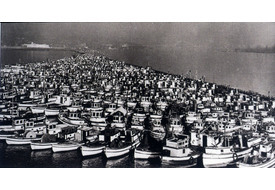 Card Text: Confiscated fishing boats belonging to Japanese-Canadians, 1942, later sold. 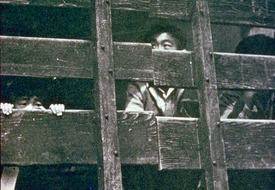 Canada interned over 22,000 Japanese-Canadians during World War II and took their boats. Title: "Round up of Japanese fishing boats," Westminster, Fraser River, British Columbia. Citation: Leonard Frank Studio, Special Collections, Vancouver Public Library, 3981 Main St, Vancouver, BC V5V 3P3 CANADA. No. 3190. Card Text: A truckload of Japanese Americans being moved to relocation centers from San Pedro, CA during World War II. 1942. 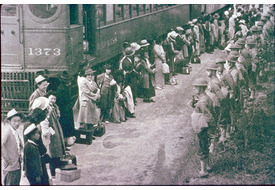 Card Text: Japanese Americans during World War II relocation, lined up facing a line of US Army soldiers. They have just arrived at the Santa Anita Racetrack center, April 5, 1942. 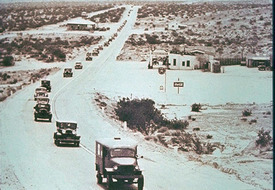 Card Text: A caravan of American Japanese cross the desert under the relocation program. 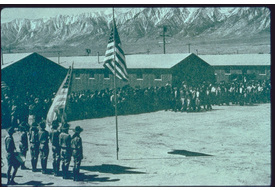 In late March 1942 a group of volunteers drove to Manzanar Center near Lone Pine in eastern California to begin building the relocation center. 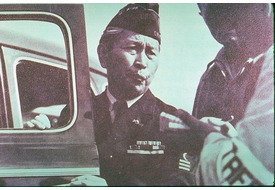 Card Text: Even Japanese Americans who had served in the military forces were not exempt from the relocation centers during their early stages. Here a man dressed in uniform indicating service in World War I enters the Santa Anita center. 1942. 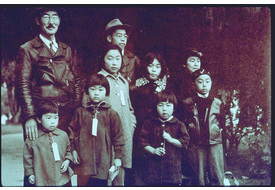 Card Text: "Members of the Mochida family awaiting evacuation bus," Hayward, California, May 8, 1942. 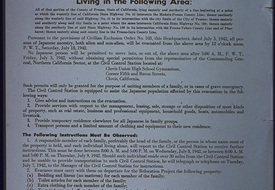 Card Text: "Poster: Instructions to All Persons of Japanese Ancestry Living in the Following Areas…" July 3, 1942. Card Text: Manzanar Relocation Center, message from the project director of the high school yearbook: "In years to come, when the war is over, and peace has returned to the world, people may say to you, 'What was Manzanar?' Then I hope you may say that Manzanar was a wartime city that sprang up from the sands of the desert of Inyo and returned to desert with the end of the war. It was the largest city between Los Angeles and Reno. It was a city serving a wartime purpose where people lived in peace and good will, where there was a school system that taught young citizens the ideas of American citizenship, where schools were of as high a rank as other California schools, and where students dedicated their lives to the American way of living. I hope you may say that Manzanar was an experience worth living, where the important realities of life were made clear and where there was time and opportunity to prepare for participation in the work of winning the peace based on tolerance, understanding and good will. The graduates of Manzanar have a great contribution to make in determining the kind of world that it is to become after the war. Ralph P. Merritt, Project Director." 1944. Card Text: Map of the sites of the ten relocation centers that housed Japanese Americans during World War II. Card Text: Map of the Exclusion Area, Japanese Evacuation Program. The dotted line shows the exclusion area boundary lines. 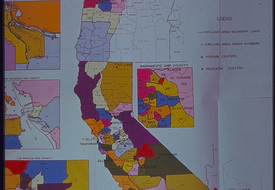 The map shows the assembly centers and relocation centers. Each exclusion area contained an evacuee population of approximately 1000 persons. 1942. 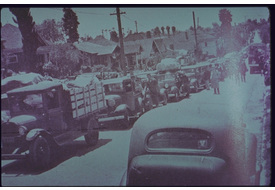 Card Text: A caravan of trucks and private cars loaded with baggage ready to leave a control station in Los Angeles, April 28, 1942, for the Manzanar Reception Center. Evacuation was later handled by train or bus. 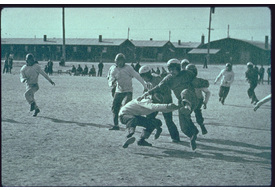 Card Text: Japanese American children playing football at the Heart Mountain, Wyoming, relocation center during World War II. 1943. Card Text: The Boy Scout troop formed at the Manzanar relocation center by Japanese evacuees during World War II. The troop is lined up and saluting the American flag. c. 1943. Card Text: The Assembly Center at Tanforan Racetrack just after the Japanese Americans moved in following removal in World War II. 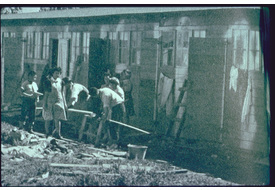 "Former horse stalls were used to house Japanese Americans evicted from their homes in San Francisco. Twenty-five stalls were condemned by San Mateo County Health officials as unfit to live in, but they remained in use." - The Japanese American Museum of San Jose (JAMsj). c. 1942. Card Text: Tanforan Racetrack two months after Japanese Americans were placed there during World War II. 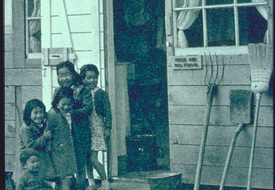 This photograph shows smiling children standing in front of the door. Before them is a garden plot. All improvements were made by the evacuees themselves. c. 1942. 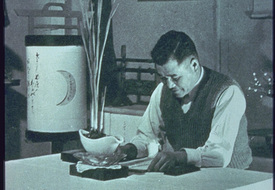 Card Text: A Japanese American man, a World War I veteran, in the interior of housing located at Heart Mountain Relocation Camp, Wyoming. c. 1943. 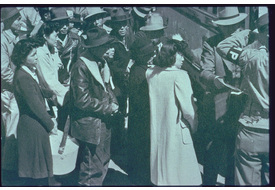 Card Text: Japanese Americans during the World War II relocation, waiting to board a train at the Santa Anita Racetrack center. 1942. 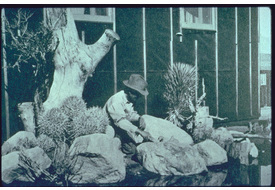 Card Text: Japanese-style landscaping, using local materials, done by William Matsuki, one of the evacuees at the relocation camp for Japanese Americans at Manzanar (CA), World War II. c. 1943. 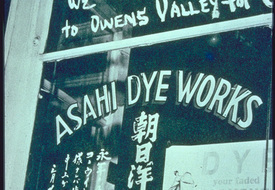 Card Text: The Japanese-owned "Asahi Dye Works," which was closed at the time of the Japanese-American World War II relocation. Above the window is the derisive note: "WE WON'T TAKE IT TO OWENS VALLEY FOR U." 1942. Card Text: Japanese-American discrimination in California, 1941. 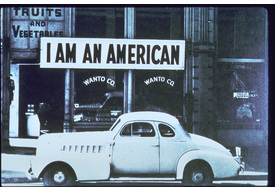 This sign outside the store of a UC-educated Japanese-American failed to protect him from race hatred. The sign reads: "I Am An American." Citation: Dorothea Lange photo, Works Progress Administration. Still Picture Division, U.S. National Archives and Records Administration, 8601 Adelphi Road, College Park, MD 20740-6001. In Bernard A. Weisberger, The American Heritage History of The American People, 1971, p. 324.